Research guru and money manager James O'Shaughnessy forced many professional and amateur investors alike to rethink their investment beliefs when he published his 1996 bestseller, What Works on Wall Street. O'Shaughnessy back-tested 44 years of stock market data from the comprehensive Standard & Poor's Compustat database to find out which quantitative strategies have worked over the years and which haven't. To the surprise of many, he concluded that price/earnings ratios aren't the best indicator of a stock's value, and that small-company stocks, contrary to popular wisdom, don't as a group have an edge on large-company stocks. Today O'Shaughnessy is the Chief Investment Officer of O'Shaughnessy Asset Management. Since 2003, this portfolio has returned 266.2%, outperforming the market by 74.0% using its optimal monthly rebalancing period and 20 stock portfolio size. 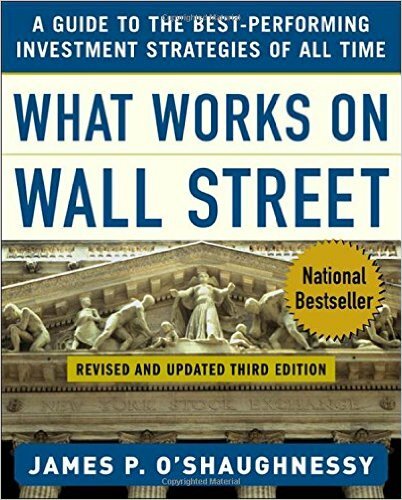 Validea used the investment strategy outlined in the book What Works on Wall Street written by James P. O'Shaughnessy to create our Growth/Value Investor portfolio. Based on his research, O'Shaughnessy developed two key investment strategies: "Cornerstone Growth" and "Cornerstone Value." Cornerstone Growth favors companies with a market capitalization of at least $150 million and a price/sales ratio below 1.5. It also looks for companies with persistent earnings growth over a five-year period, and shares that have been among the market's best performers over the prior 12 months. This strategy makes sense for value-oriented growth investors who have the patience and personality to stick with a purely quantitative investment approach. Cornerstone Value looks for large companies with strong sales and cash flows, and solid dividend yields. It is appropriate for income-oriented investors.